If you are boating, camping, or traveling in a recreational vehicle, you don't always need all the amenities of a bathroom. Also, a portable toilet can be cheaper than having to install plumbing for a bathroom. Portable toilets are handy in many situations when going long distances. (They will also save you the effort of having to ask directions or look for a restroom somewhere.) There can be also emergency situations--such as a clogged toilet or the water being shut off--where they can also be of use. Here is a guide to some of the best portable toilets on the market. Bucket Toilet—These are the simplest, with just a bucket, a seat, and a lid. Since this is a simple design, these are the most foolproof. There are also accessories such as disposable bags, sanitizing chemicals, and toilet paper dispensers that come along with the toilet. 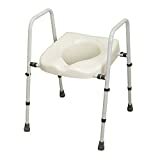 Collapsible Toilet: this toilet consists of a seat that is supported by collapsible legs over a collection bag. After use, you dispose of the bag, and fold up the legs. Then you can pack it away in the trunk of your car. They are also convenient because of their light weight (5 pounds on average). 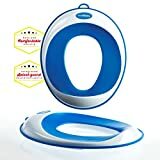 Portable Flush Toilet: This type of toilet operates like a toilet in your home, with a water tank that flushes out the toilet. You fill up the tank with fresh water, and then pump the water into the toilet after use. Instead of having a disposable bag, it retains the waste in a closed container until you empty out the toilet. Easy to clean: A lot of customers are concerned that the toilet should be easy to clean. 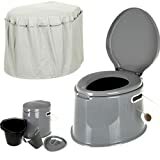 The bucket toilet and collapsible toilets can be fitted with a bag for disposal. You just separate the bag and throw it out. The flush toilet has a container for waste, that you detach and empty into a regular toilet. There are also waste disposal stations for people camping in national parks. Sturdy material: A concern about the flush toilet was that it shouldn't leak. Most customers said that a well-made flush toilet didn't even leak if it tipped over. (That's a risk with a portable toilet in a trailer.) 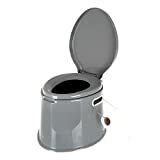 The flush toilet models have to be the sturdiest, since they have so many functions and parts. Weight capacity and height: Most portable toilets can support an adult male—up to 250 pounds of weight (113.6 kg). As for the height, people noticed that in some cases the toilet was too low off the ground, which made it uncomfortable. So it's worthwhile looking for a taller model. Tank Capacity: This tells you how much use you can get out of the toilet without having to empty it. The portable flush toilet models will also have a value for how much fresh water it can carry to clean out the toilet after use. You fill the tank with fresh water when available, so it is ready for use later. They also provide a deodorant to add to the waste before flushing the toilet, so that odor is not a problem. Water level indicator: Portable flush toilets will have an indicator for how much fresh water is in the tank. That's handy to know when it needs to be refilled. Toilet paper and other accessories: Portable toilet companies make special, biodegradable toilet paper that dissolves in water. This is more handy than regular toilet paper when you have to dispose of the collected waste. You also have to stock up on the chemical deodorizers to remove the smell. Some of these chemical additives also liquefy the waste, so that it is easier to clean the tank. Reliance Products Ltd.--was founded in 1958 in Winnipeg, Canada. 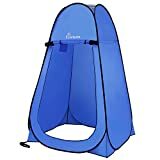 They specialize in hydration, sanitation, and purification items for outdoor camping. Their products are designed to be as environmentally-friendly as possible, both in the course of manufacture and during use by the consumer. Thetford Corporation— is a company based in Ann Arbor, Michigan that was founded in 1963. They specialize in kitchen products, refrigerators, and sanitation products for people traveling. Camco— is a company founded in 1966 in Greensboro, North Carolina. They offer camping and recreational vehicle supplies and accessories, and have over 3000 products. Sanitation Equipment Ltd.-- is a company based in Edwards, Colorado. They were founded in 1949, and specialize in making portable toilets and sanitation equipment for people traveling by land or by sea.